News | Alan Moore enters the Internet for Harvey Pekar and CLEVELAND! As announced yesterday in Fast Company, the one and only Alan Moore is coming out in a big way to support the man he calls "one of the very finest writers ever to grace the comic medium... my late great friend and inspiration, Harvey Pekar." Less than two years after Harvey's death, Alan is throwing his efforts behind two major projects to honor his memory. First, Harvey's wife Joyce Brabner is spearheading the creation of a memorial statue in Cleveland, Ohio: a monument to Harvey, his work, his love for public libraries, and the unlimited possibilities of the comic book medium. To help raise funds for the project, Alan Moore is making a rare exception to his Internet-free lifestyle and offering an invitation-only video conference with anyone who donates $99 or more! For more details, click here or watch the video embedded after the jump. Secondly, we're proud to announce this week that Alan Moore has written the introduction to Harvey Pekar's Cleveland, the posthumous graphic novel with art by Joseph Remnant, coming from Zip Comics and Top Shelf Productions in February 2012! It's simultaneously an autobiographical snapshot of Harvey in his busy final years and a love letter to the city where he spent his entire life. As Alan says, "Harvey inspired in me an absolute artist's confidence in the celebration of places where we live, the ordinary things of our lives, and streets that surround us as suitable subject matter of creative endeavors. He took his life in Cleveland and personal history, and turned them into beautiful comic book captures of little human moments." Donations for the memorial statue project (and Alan's videoconference) are still open through December 4. 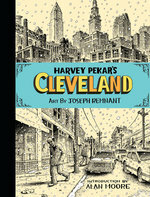 The book, Harvey Pekar's Cleveland, is available for pre-order now, and will be released in February. We're honored to be able to help keep Harvey's legacy alive.